It goes without saying that Bread People eat a lot of bread. Which also goes to say, they have a lot of crumbs in their homes. As all this bread-eating usually outpaces bread-cleaning, all those crumbs pile up. Just like you don’t clean the crumb tray out of your toaster after every use, Bread People don’t clean away the crumbs after slicing into a loaf; it’s just going to get all crumby again at the next meal. I know all this, because I am a Bread Person. Far from being an affliction I wish to remedy, this breadliness does, however, warrant some special considerations. 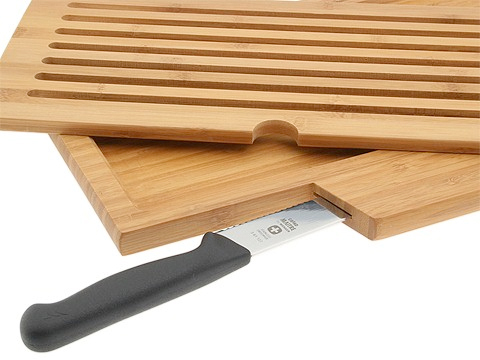 The Swissmar Bamboo Crumb Catching Board w/Bread Knife hides wayward crumbs, collecting them underneath a slotted cutting surface. 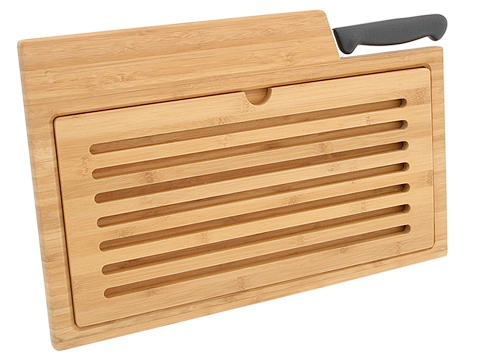 Since we all have to have to clean out the crumb tray at some point, the slotted insert is easily removable. Included is a Wenger Grand Maitre 8.75″ bread knife, but while some people may enjoy the integrated knife slot, Bread People will find it useless. It’s not like we’re going to ever put away the bread knife anyway.